There is much to look forward to when planning a Niagara vacation, and getting away from your stressful routine to enjoy some much-need rest and relaxation is just the beginning. From the region’s stunning waterfalls and wine country to our world-class restaurants and nightlife, you can literally spend every minute of every day in wonder and gratitude. Niagara is a veritable feast of fun for people from all walks of life. It doesn’t matter whether your idea of a good time includes slot machines or hiking, a Niagara vacation is almost certainly the vacation for you. That being said, some of Niagara’s attractions still manage to fly beneath the radar. One of the region’s finest lesser-known offerings is bird watching. Whether you’re a trained ornithologist or you just love putting a pair of binoculars to your eyes to find the source of a particularly thrilling bird call, a trip to Niagara is perfect for bird lovers. Here are just some of the birds you might get to see if you plan a bird watching trip to the area. Known as the national symbol of the United States, the bald eagle has been enjoying a resurgence in numbers over the last couple of decades. Still, getting to see one of these creatures in its natural habitat on the Niagara Peninsula is a tremendous treat. A large bird, the bald eagle’s wingspan ranges from six feet to seven and a half feet, and watching one snag a fish from the Niagara River with its impressively large talons is a sight you will never forget. A smaller, freshwater marsh-loving bird, the black tern is a species of some concern due to the increasing loss of its habitat throughout Canada and the United States. A very social bird, it summers throughout Canada, and the Niagara region — especially around Niagara Falls — is a hot spot for sighting it, especially since flocks of black terns can sometimes number in the thousands. 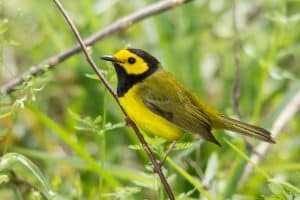 A lovely bird with golden plumage and a distinct black hood, the hooded warbler is a vulnerable species due to widespread habitat loss. When you visit Niagara, you can find them skulking about the undergrowth of many of the area’s Carolinian forests. Keep your eyes on the lower branches of trees where these striking little birds like to snag flies, moths, caterpillars, spiders, and flies. 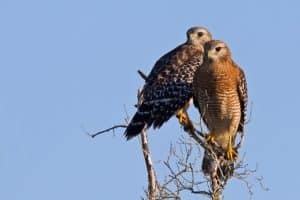 An impressive bird of prey, the red-shouldered hawk has also suffered from declining numbers in the past few decades, but it’s still relatively numerous in the Southern and Eastern United States. Its call is noteworthy: clear and conspicuous and often imitated by Blue Jays. It sometimes makes its way to Niagara to breed, and when it does, it sticks to the forests. Like most hunters, this hawk enjoys a wide-ranging diet that includes reptiles, other birds, small mammals, and amphibians. The next time you come to Niagara, be sure to bring your birding glasses and your identification book with you. From the bald eagle to the hooded warbler, there are many species of bird about. Many of them are beautiful. Some of them are rare. To the fervent birdwatcher, all are worth seeing up close.